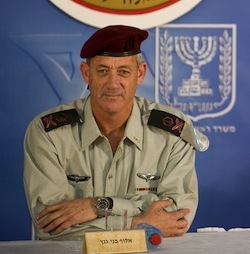 Adding to the hope that the constant threats of war are empty ones, Israeli military chief Lt. Gen. Benny Gantz today expressed confidence of a diplomatic solution with Iran, adding that he didn’t think Iran would attempt to develop nuclear weapons. The comments, made in a high profile interview with Israeli newspaper Haaretz on the occasion of Israeli Independence Day, also include an admonishment to avoid “hysteria” about Iran’s program. This probably won’t sit well with the nation’s civilian leadership, which is constantly claiming Iran is “close” to nuclear weapons capability. Netanyahu and other Israeli officials have been expressing anger at the ongoing diplomatic negotiations with Iran, insisting that they have no hope of working. Defense Minister Ehud Barak even claimed last week that Israel might launch an attack while the negotiations were ongoing, saying that talking to the P5+1 didn’t “exempt” Iran from attack.